Landy standing on his 13-metre installation in lower Martin Place. Not all good ideas make good art works. Michael Landy’s Acts of Kindness, the latest Kaldor Public Art Project, is a case in point. Highlighting unexpected moments of generosity and compassion between strangers is a nice idea; what’s not to love? In a culture driven by the mantra, “Me, me, me” Landy has managed to collect 700 stories from Sydney-siders describing “random acts of kindness”: proof that people can still muster a spot of altruism on occasion, even in the big city. But the way Landy has presented this evidence, comforting and heart warming as it is, makes for very dull visual art. 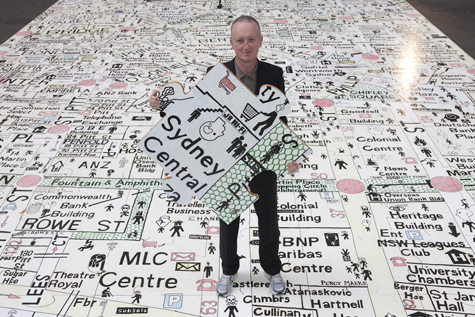 Landy has installed a big hand drawn map in Martin Place, in the form of a 13-metre-long jigsaw puzzle. The scale of this is obviously meant to be impressive as it is repeatedly mentioned on the Kaldor Projects website. But the piece itself, while having a certain naïve charm, is not particularly compelling. It is mildly amusing to walk on it, traversing the city in a few steps like a cartoon giant, but this is expressly forbidden by a sign that nobody seems to have read. The acts of kindness themselves are posted around town as text printed on jigsaw shaped signs attached to posts, like street signs pointing towards goodness. Some of them are amusing or touching etc, but the puzzle-piece signs look kitsch (and not in a cool way) and all that reading becomes a bit of a chore. I suspect that this idea is just not one best suited to a visual presentation. Acts of Kindness is a missed opportunity. It would have been perfectly suited to a GPS based i-phone app. Imagine wandering the city, then being alerted to the fact that you had stumbled on to the site where one stranger was kind to another. You could then listen to the story, instead of having to read it, while standing in the actual spot soaking up the atmosphere. Or a low-tech, and perhaps more exciting, strategy might be to employ actors to loiter on the sites and accost passers-by with their tales of kindness. Either of these interactive solutions would be more engaging, and would better suit the idea. After all, interaction is what random acts of kindness are all about. Michael Landy: Acts of Kindness is on until October 23. Landy’s idea is great. I have not seen his work as I do not live in Sydney, but I agree with your comments. I think what happens in the interaction between people requires the same emotional input for the audience. When I imagine to see the story in print it is to me dead. Actually, the artwork was most interesting before it was executed, when the artist was calling for input (that interaction factor again). I posted a story and went to see Act of Kindness hoping to find mine, but I lost interest very quickly when I saw how the work was presented. its seems like a well intentioned thing, but…..
Why not give it to someone who could use it. Destroying things only creates more demand! Indeed. and giving away everything you owned would have been (almost) as radical of an act as destroying it all…. Yes, very interesting. You’ve hit the nail on the head again as usual. I had a strange experience with this one myself. The day before Landy’s visit to SCA, I ventured into Martin Place to familiarise myself with the piece as I was to introduce him to the faculty before he delivered his talk. I knew nothing of the nature of the work and the only markers I had were the City of Sydney’s banners near George Street. I searched up and down Martin Place for close to an hour, not finding anything. But, I did find a bloke in a tatty business suit holding a sign in one hand that read, “unemployed: down-but-not-out”. In his other hand, he held a fist-full of coloured pens for sale. I wondered if this “performer” was connected Landy’s work and bought three pens off him just to be safe. Then I found another bloke offering a shoe-shine for $5, and I duly obliged, also to be on the safe side. So, I then figured that Michael Asher-like, Landy had simply designated Martin Place as a zone for Acts of Kindness. Pretty cool, I thought – a nice intervention. Problem was, at the pre-visit get-together the next day, Landy told me that the work hadn’t been installed yet. I have to say his actual project paled in comparison. Your experience sounds like what the work should have been. Perfect!